Find matching pairs of sounds. The game ends when you have found all the matching pairs, and your score is provided. There is no time limit. Press “Play” to start. You get three games in a row with unchanged settings and selections, before you return to the Main Menu. The faster you find the matching cards, the higher your score. Default setting is "Flick" mode, with 6 cards and the Ballylanders' soundset. Drag game: use finger drag to move from one card to the other. Flick game: flick left and right, up and down, with one finger. Wheelie follows every flick! When you flick to either end of the grid, you hear a VoiceOver alert to indicate that you reached the end/an empty cell. “Open Sounds” & Flick mode: Explore the sounds with finger drag. To proceed to the Flick game, double tap and flick right twice. 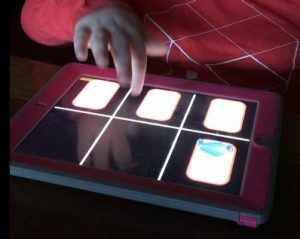 This mode is a great training activity, encouraging children to drag around the screen and hear the sounds. "Black Curtain" creates a level playing field for all. Turn on/off in Settings. With no visual feedback at all, sighted players need to completely rely on the same skills as children who are blind use to navigate the game, which makes for an exciting challenge for all. Double tap the button in the bottom right corner to return to the game menu. While busy navigating the screen to locate, memorize and pair the matching sounds, children will build a basic understanding of how a digital grid is built up, from rows and columns. Each game starts with spoken information about the layout and soundset of the grid, and during play, rows and columns are spoken. This is essential learning for building skills to navigate mathematical grids and tables. The app is accessible and self-voicing. The Startpage is VoiceOver accessible. Then VoiceOver should be turned off, and the Accessible Menus turned on. Double tap button in top left corner of Menus page to return to Startpage to turn Accessible Menus on/off. Accessible Menus is specifically designed for menu navigation by experienced, blind users. TIP: To assist a player who is blind with the screen navigation, use an iPad case that covers the inactive border of the iPad screen.